Lumiappaday started as a little project/challenge to share some apps everyday that I enjoyed since I first got a WP but had been waiting for a Nokia Windows Phone to share it on MyNokiaBlog.com. 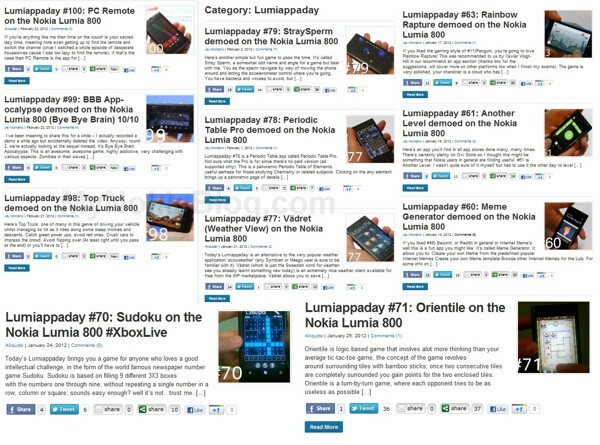 The apps work for all WP but I’m focusing them for Nokia folks using Lumia handsets, hence Lumiappaday. I guess in hindsight I might have left the extra a (lumiaapaday) there as it then it would look Finnish (well to me anyway). When I said I’d be doing one everyday, I didn’t realise how much of a task I let myself in for, but surprisingly everyday since November 22nd, we’ve managed to get at least one Lumiappaday 🙂 Major thanks to Ali (and Nokia Connects for his loan Lumia) who has helped lighten the load quite a lot assisting in several Lumiappadays, finding lots of different apps I had not come across. It surprises me that it has reached this far as they take surprisingly quite a lot of time to do. I thought blogging alone might be difficult to maintain but then another commitment? But I enjoy finding apps to share (as of course, blogging) so it doesn’t seem so much of a chore. Plus, it is easier now not being the only person doing lumiappaday. It’s kinda nice to have a ‘day off’ so to speak every now and again :p (as in days when I’m just exceptionally busy and can’t guarantee I’ll be able to upload them in time in the morning an do all the necessary procedures. What do we usually do? What’s taking time? 1) Using the app. Some apps require more time to know what everything does. Some apps are quite addictive e.g. games so lots of time spent playing :p2) Recording. Takes a bit of time to set up (for me anyway, and more for rerecording accidentally deleted vids). My 60D is annoying, I might be recording and it’s completely out of focus or it decides to randomly stop recording :S3) Processing. My computer’s not the fastest so it can take between 1.5-4 hours to process a video (depending on the length) 🙁5) Uploading. Thanks to Virgin Media this may take 1-2 hours. I have since compressed the videos further so they might upload quicker but only marginally.6) written portion and photos. I love how photogenic the Lumia 800 looks in the hand. Although we’re saying there are already tons of apps on our to do list, we still always welcome suggestions. Sometimes if there’s one that we really like, we put that ahead on our list. In terms of new apps for WP, we don’t normally talk about them until we get around to demoing them as I think there would be too much in the way of app news. But obviously we’ll still love to hear about them if you tip them so we can put them on the list of apps to demo. Something else we’ve heard from you guys is not wanting N9 to be left out. When I first did Lumiappaday, I never thought I would actually get a Nokia N9 from Nokia. It was not something I had planned to have time for and was unwilling to make the same commitment I did with Lumia apps. As mentioned, even blogging itself gets difficult by the day due to med school schedules, let alone doing Lumiappadays. So, due to time constraints, I’m not able to do the same level of video demoes with the N9. However, I will now try and share apps aout the N9 and take snaps from the N9. If I have time, I will occasionally do videos (or if there are videos from others, we’ll share that). Again, we would gladly welcome tips for some great N9 apps to try/share. Anyway, 100 Lumiappadays. YouTube says that’s 7 hours, 52 minutes and 40 seconds worth of videos. It’s also accessible if you go to Lumiappaday.com. You might need to click refresh as it doesn’t always automatically redirect. We have a playlist on YouTube: http://www.youtube.com/playlist?list=PL7DDD5E39861D9A47 You can subscribe for updates on video uploads.